Baby C had just turned eight months old when we got home from our trip visiting family in Europe. While in Germany, we went skiing at the highest ski resort in all of Duetchland. Zugslitze is roughly 3000 meters (10,000 ft) high and is home to three glaciers. There are 360 degree panoramic views of stunning alpine gloriousness. However, the skiing is subpar and most Germans don’t actually come here for the skiing, rather more for the novelty of it. because we didnt satisfy our ski urges, when we got home we needed to hit the slopes immediately. It would be the first time Baby C would ride with my husband down the mountain. Our local favorite mountain is White Pass for its killer expansion with open, fluffy terrain and excellent tree runs. They also allow baby in backpacks! It’s best to check with your local mountain before bringing baby on the slopes because some resorts do not allow it. -Warmth. Keeping baby warm is crucial. He’s not moving, so he needs extra layers. -Type of carrier. 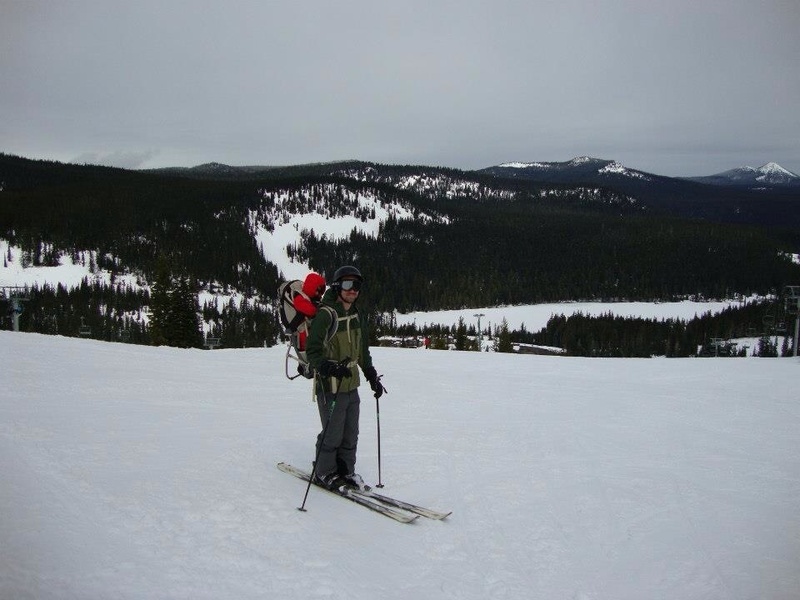 The first time we used a serious backpack carrier but in hindsight we would have used the Ergo. Balance is way off with the backpack, it’s bulkier and more difficult to hold on the chairlift. The Ergo is better because it holds baby closer to you keeping him warmer and the transition from back to front on chairlift is much more manageable. -Falling or being run into. Did I miss anything? I left the last one unexplained because there is a lot to say about it. It’s everyone’s biggest concern and I just know it’s YOUR biggest worry. There are two camps on skiing with a baby and typically not much of a middle ground. There’s the “no way, too dangerous, how irresponsible” camp and then there the “go for it, do whatever, it’s your baby, your risk” camp. It’s obvious where my husband and I stand. We have no delusions about the situation and we take it very seriously. No amount of skill can predict a fall or being run into by another skier. It’s an innate risk, no getting around it. The only control you have in the situation is to be alert and confident in your risk assessment. For instance, don’t pick a weekend day when it’s busiest, don’t ski tree runs, and don’t hit the terrain park. Those are all major duh’s. 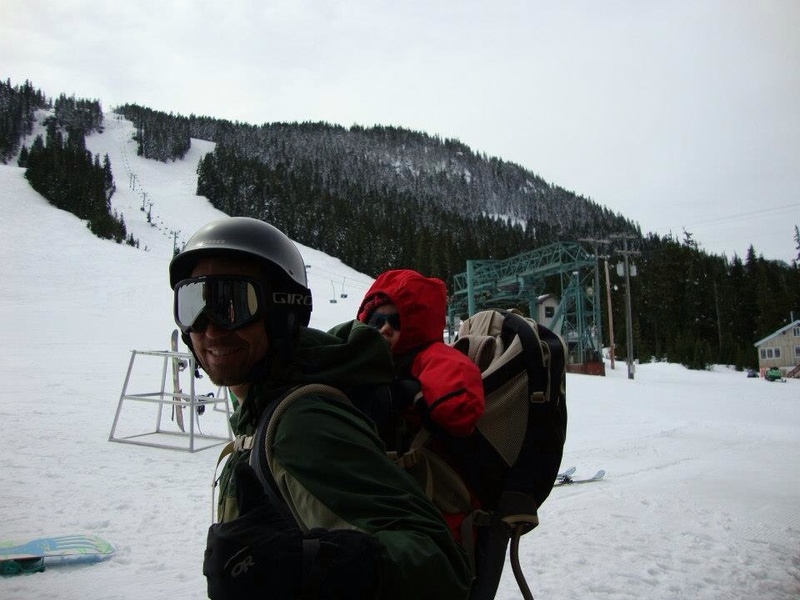 I will not attempt to convince you to ski with your baby, and no need to convince me otherwise. We have two grandmas to do that. That is all on that topic. The end. Shhh. How did Baby C like it? He thought it was just okay. Just OKAY!? Ingrate. We just strapped you to our back and zipped down a mountain and it was just okay, mediocre at best? As anticipated, he was scared at first. Mostly he was afraid because it was nap time and every time he’d come out of his sleepy stupor he’d be flying down a mountain. There were moments of excitement for him, but we concluded he would enjoy it more when he got a little older. Was it selfish to take him on the slopes, of course it was, but do we have any regrets? No way. Life keeps going even when you have a baby, so you might as well strap him to your back and keep on living! If you have any logistical questions, let me know! Share your baby ski story!